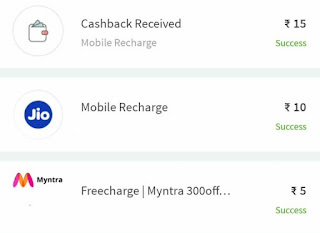 Freecharge is Running Few Rs.1 Deals From Which You Can Get Free Rs.40 Recharge. This Offer is Fully Working & Fully Tested By Us. You Can Have This Freecharge Cashback deals In Your Old Accounts Too. 1, Firstly Download Freecharge by Clicking Here or go to the Web link by Clicking Here. Now Purchase Each 1 By 1 & Copy The Freecharge Code You Get After Purchase , You Can Purchase This Deals With Freecharge Cash Too.